Welcome back for Day 6 of the Clint Eastwood Spotlight Series, where we’ll be talking about one of the actor/director’s biggest modern triumphs: Million Dollar Baby (2004). First of all, this is an amazing movie. It’s the kind that elicits a physical reaction at the core of your being, like the chambers of your heart might legitimately be torn asunder. Think I’m being dramatic? Watch the movie. You’ll see. This small insight, as well as the fact that all Eastwood’s letters to Katie return to him unopened, are the only semblances of light that are ever shed on Frankie’s separation from his daughter. Yet, oddly enough, it almost doesn’t matter that we don’t know what’s going on there, because Maggie Fitzgerald (Hilary Swank) soon walks into Frankie’s life, and eventually his heart. Maggie hails from southwest “Missoura” (among the hills, according to Morgan Freeman’s character, situated “somewhere between nowhere and goodbye”), and somehow manages to be both exceptionally tough and extremely adorable. She is hopeful, hard-working, and all she wants out of life is to become a boxer–she says it’s the only thing she’s ever felt good doing. Her family is trashy and classless at best, and she knows that if she can’t chase down her boxing dream, she will be limited to scraping plates in the trailer park with them for the rest of her days. Frankie doesn’t want to train her as one of his fighters–he never trains women–but eventually, her work ethic and stubborn willpower successfully wear him down. He agrees to take her on. As the film progresses, we see that both Frankie and Maggie are filling the lonely void in each other’s lives. Neither has realized just how much they needed the other, but as time and training go by, Maggie becomes like a daughter to him. She slowly but surely rises to the top of her boxing class under his tutelage, even though he is initially hesitant to arrange any big fights for her. Finally, after much wheedling and insistence from Maggie that she’s ready, Frankie sets up a match against a top-ranked UK opponent. Right before the fight, he gifts her with a beautiful, green silk robe, embroidered with the Gaelic words “Mo Cuishle” on the back. She asks him what it means, and he gruffly/shyly tells her he doesn’t know. Emboldened by the gesture, as well as some tough-love feedback from Frankie in the middle of the fight, Maggie goes on to win by K.O. that night. She becomes a scrappy, crowd favorite, grinning from ear to ear as chants of “Mo Cuishle! Mo Cuishle!” fill the arena. 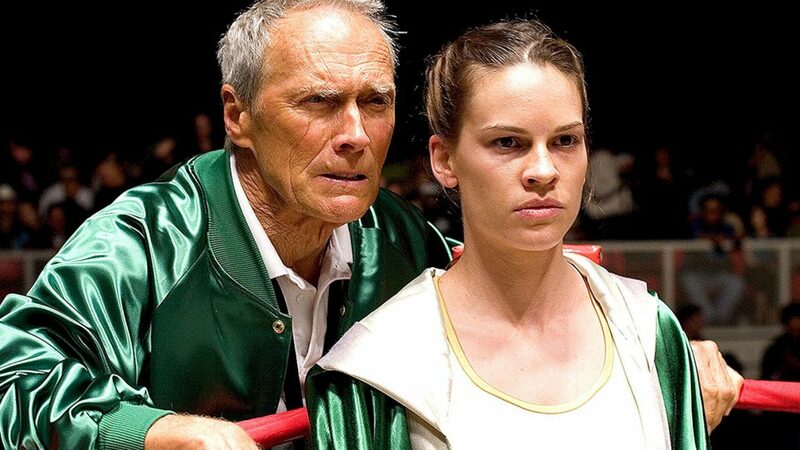 Million Dollar Baby took home four Oscars that year: Best Picture, Best Director (Eastwood), Best Actress (Swank), and Best Supporting Actor (Freeman, whom I didn’t talk about much in this review, but he is excellent as Eddie “Scrap-Iron” Dupris). It’s easy to see why, because everyone who was a part of this film clearly poured their heart and soul into its production. Having a close relationship with my own dad, this story and the incredible father-daughter chemistry between Eastwood and Swank really speaks to me. I’m pretty sure I experienced every possible human emotion while watching Baby, and I can honestly say it’s one of the best movies I’ve ever seen. Tomorrow, join me again for the final day of our Clint Eastwood Spotlight Series! I’ll be discussing Gran Torino (2008), so be sure to come on back as we wrap things up.